Camp fun. Activities for everyone. We have created a place with so many diverse activities, no one should ever walk away without having their kind of fun. 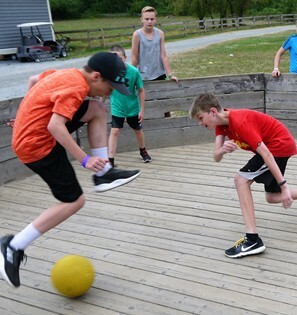 Activities vary, depending on the age group and whether you’re attending one of our camp-sponsored events or renting the facilities as a guest group. 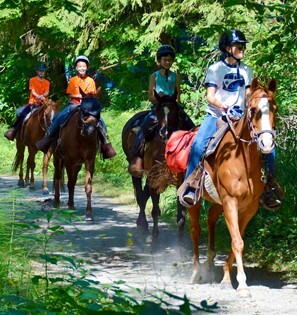 Trailriding – where you can go around the ranch or up in the bush and enjoy the wind in your hair as you trot along. Challenge Course – a 16-part low-level ropes course with beginner, intermediate and expert challenges. Team-building course – with 8 cooperative elements. It provides a wide range of opportunities for learning together and helping people leave their comfort zones. Skateboard Park – for the summer we bring out the boards, ramps, and half-pipe — for those who want to rip it up! Horsemanship – where you can learn more about caring for and training horses, and of course riding lessons to learn Western style riding. Climbing Wall and Rock Face – for those who want the thrill of the climb. We supply all the safety equipment and instructors – you provide the energy and enthusiasm! 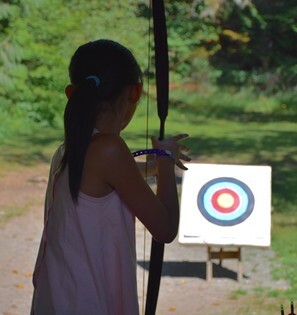 Archery Range – set up on the corner of the Ranch property, so you can do some serious target practice. Game Zone – includes several fun activities such as Hyper Ball (Gaga) and Nine Square in the Air. Riflery Range – where we set up targets or cans to test your aim and learn new skills. The Ranch has a number of pellet rifles available with proper supervision. 400′ Double Zipline – climb up a cargo net to a platform 25 feet in the air, and then soar across the horse fields to make the perfect landing – if you can! Swimming Pool – for a refreshing dip on those hot days. The 3-foot deep pool, located at the center of the cabin ring, is perfect for water volleyball and other games. Guest groups using the pool are required to provide a lifeguard or other adequate supervision, but camp-sponsored events always include trained lifeguard supervision when the pool is open. The pool is heated and available for use from April 15 to October 15. Petting Zoo – an outdoor, fenced area, which includes several animal stalls, a rocky hill, and a wash-station. We usually have goats, chickens, ducks, rabbits, Jersey calves, and a variety of other farm animals. The occupants change throughout the year, but from April to October there are interesting and fun young animals to get up close and personal with! Ping Pong, Air Hockey, and Foosball tables – are also available in the basement of the lodge. Covered Wagon Rides – for some good, old fashioned fun! Guest groups may book covered wagon rides for up to 35 people at a time. Copyright © 2019 Timberline Ranch Society. All rights reserved.